A cookbook for making delicious, inventive, and fast tamales using time-saving tips and tricks that simplify the prep-intensive traditional process. Tamales are a Mexican favorite, beloved year-round as well as at Christmas, when the whole family traditionally pitches in with the work of tamale preparation and assembly. Thanks to renowned tamalera Alice Guadalupe Tapp, it’s now possible to enjoy these delicious treats with a lot less labor. Tapp has worked her tamale magic to turn the classic process on its head by paring it down to three to four steps that can be done in as little as forty-five minutes using handy tips, products, and tools. All sixty dishes in the book are naturally gluten free, and include both classic tamale recipes—such as Chicken Mole, Sirloin Beef, and Fresh Poblano and Potato tamales—and novel recipes such as Chorizo and Egg, Oxtail, and Baked Fig tamales. 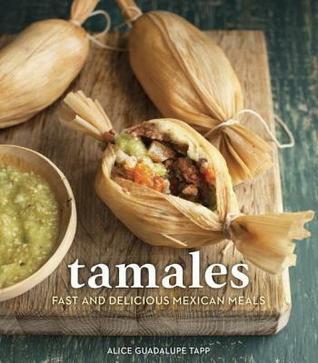 With this book, tamales are fast and easy enough to enjoy every day, and delicious enough to serve at any celebration. I did not grow up eating or making tamales, it was not until I married my wife and her family would gather one weekend before Christmas and we would make them that I began to learn. Her father taught me how to make a red chili sauce, and how to cook the meat, her mother taught how the texture of the masa was supposed to be and how to spread the dough. The problem was my wife’s other side of the family made a sweet tamale and we were never able to get the recipe before that person passed away. I have been on a quest for many years and in this book I at least came across the beginning of a sweet recipe that begins with the masa, from there I can make it work. This book has many different recipes and not just for tamales, but also salsas, moles, and even a vegan masa. Easy step by step instructions and every tamale you can think of. Overall a good book. I got this book from netgalley. I give this 4 stars.